UnderBrush.org is dedicated to the memory of Fletcher R. Buster Brush. You can support the restoration and preservation of Vermont cemeteries by making a contribution to the Vermont Old Cemetery Association. Cemetery Roster - Find your ancestors! Bookstore - Great deals on books! Fletcher Brush surveys a cemetery. Welcome to Underbrush.org! This website contains a growing list of indexes of Vermont cemeteries compiled by Fletcher Brush. We hope the information on this site will help you find your Vermont ancestors. 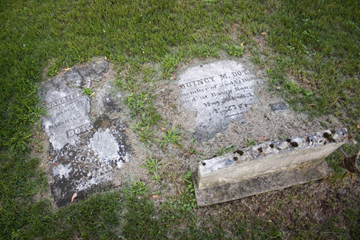 Many Vermont cemeteries are in desperate need of restoration and gravestone repairs. An important piece of Vermont’s history is at risk unless initiatives are undertaken to preserve these historic gravestones. 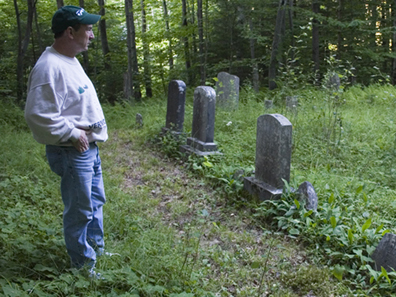 In Vermont, cemeteries are primarily the responsibility of local communities and private landowners. Many communities do not have the resources for maintenance, restoration and preservation of cemeteries. In order to preserve the historic cemeteries that dot Vermont's villages and rural landscapes, communities will need to encourage support from its citizens and family descendants. Vermont is fortunate to have the Vermont Old Cemetery Association that was founded in 1958 to “encourage the restoration and preservation of neglected and abandoned cemeteries in the State of Vermont”. The Association has played an important role to initiate restoration projects and to create public awareness of the need to preserve our historic cemeteries. If you would like to contribute to a Vermont cemetery or volunteer your time on a cemetery restoration or preservation project we urge you to contact the Vermont Old Cemetery Association or the Town Clerk Office where the cemetery is located. A list of Town Clerks Offices appears on this website. The Vermont Old Cemetery Association’s website is www.sover.net/~hwdbry/voca/.